Alcatel's new OneTouch watch has the right smarts and low enough price tag to make it an intriguing proposition. The OneTouch Watch doesn't run Android Wear, but it works with both iOS and Android and with its attractive price tag it could be a winner. The Alcatel OneTouch Watch may not be one of the headlining products at CES 2015 in Las Vegas, but hidden away on parent company TCL's booth this clever little smartwatch is certainly worth looking at. At first glance it looks very similar to the Moto 360, but with a retail price of just €100 (around £80) it's a great deal cheaper than the current Android Wear faction and the upcoming Apple Watch. Okay, so the circular 1.22-inch 240 x 204 display isn't going to blow anyone away, and while it's lower res than the likes of the LG G Watch R and aforementioned Moto 360, it's still perfectly readable. Like the Moto 360 the screen on the OneTouch Watch isn't a full circle, with a segment at the base of the display missing. This chunk houses a touch sensor allowing you to navigate around the watch, and to be fair it doesn't effect the overall aesthetics of the device too much. The attractive metal body of the OneTouch Watch measures a relatively slender 10.5mm, and it sits nicely on the wrist. There's a single physical key on the right side of the body for power/lock functions, but your main watch control takes place on screen and in the segment below it. The watch face doesn't protrude as much as Motorola's effort, and the strap is comfortable, although you can't swap it out for any old strap. That's because Alcatel has cleverly put a USB connector under a little rubber flap at the end of the strap for easy charging. Just flip the rubber up and slide it into a USB port. The battery is just 210mAh, which is pretty tiny and we question Alcatel's claim for 3 days of life from a single charge. 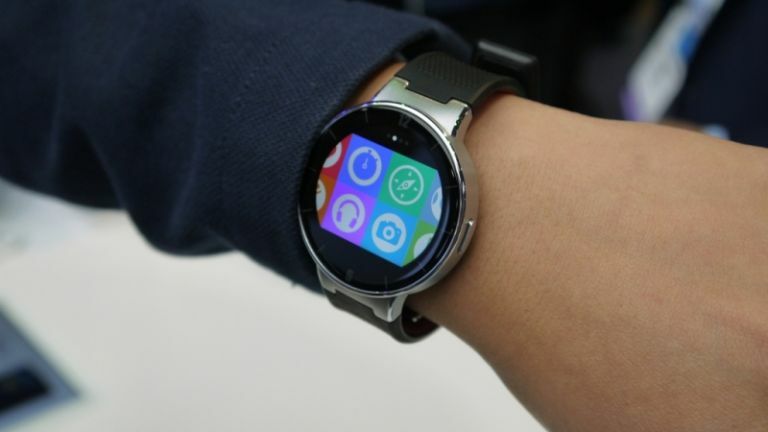 They key feature here is the fact the OneTouch Watch plays nicely with both Android and iOS. Current iPhone users don't have a great deal of choice when it comes to smartwatches, and we're still waiting for Apple's offering to hit the market. All you need to do is download the app and you can get started. The simple interface on the watch consists of a grid of pre-installed apps - which you're stuck with as you can't download any extras. There's a fitness tracker (steps, distance and calories), heart rate monitor, compass, weather, remote camera shutter, music remote, find my phone, alarm and a handful of watch faces. Tap an app to launch it, and tap the segment below the screen to exit it/go back/return to the clock face. It's all simple to use, but not overly intuitive at first. The interface isn't as fluid as Android Wear, while notifications are simply just pushed through from your phone to the watch. Slide up from the base of the screen to view your latest alerts, but don't expect to be able to reply or respond to messages and notifications. They are read-only. The Alcatel OneTouch Watch is attractive, low cost and sports the core features of smartwatch making it a decent proposition. There's a question mark over battery life, and the interface isn't the slickest, but if you're looking for an inexpensive wearable with a host of features the OneTouch Watch has you covered.